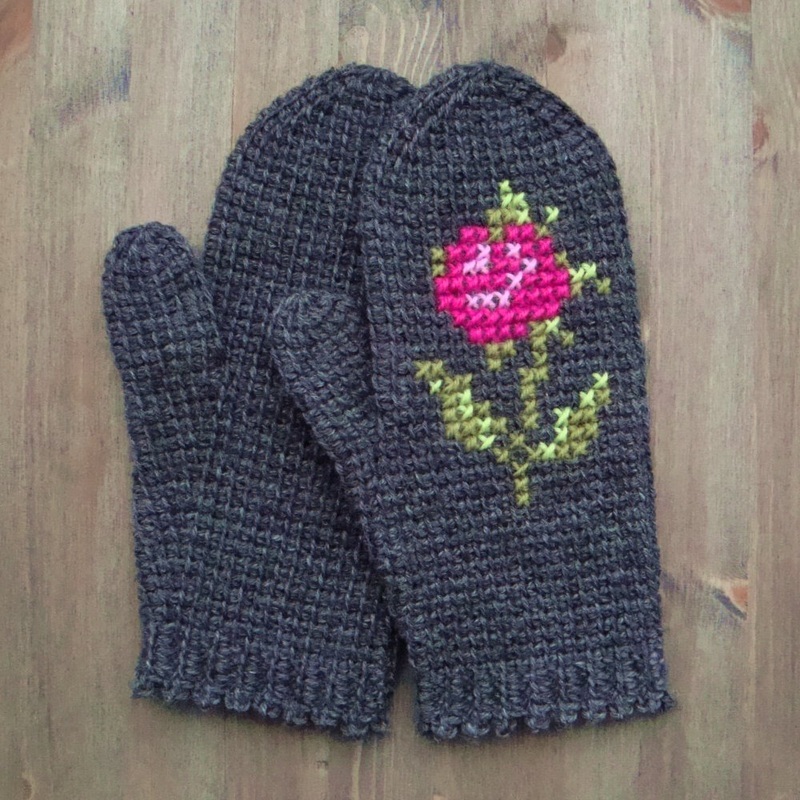 One more pair of mittens with roses. 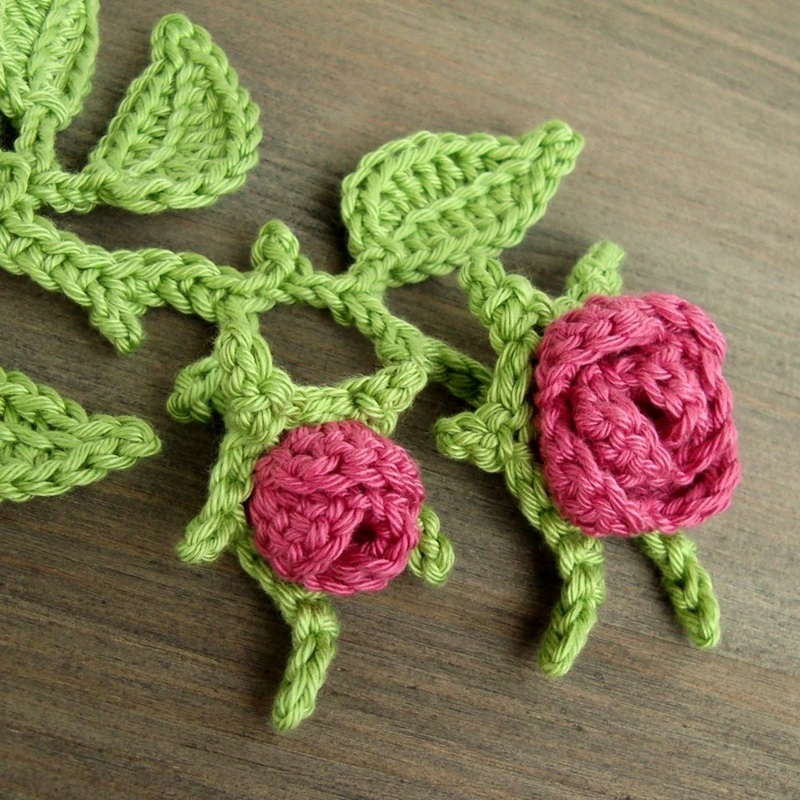 This time I made three-dimensional roses. 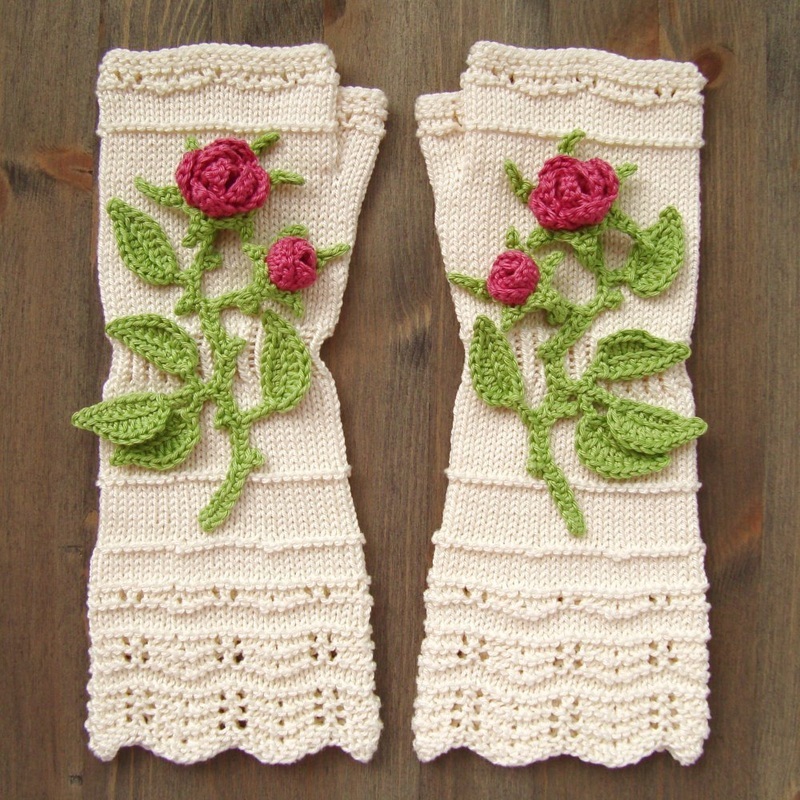 The flowers are crocheted, and the mittens are knitted. 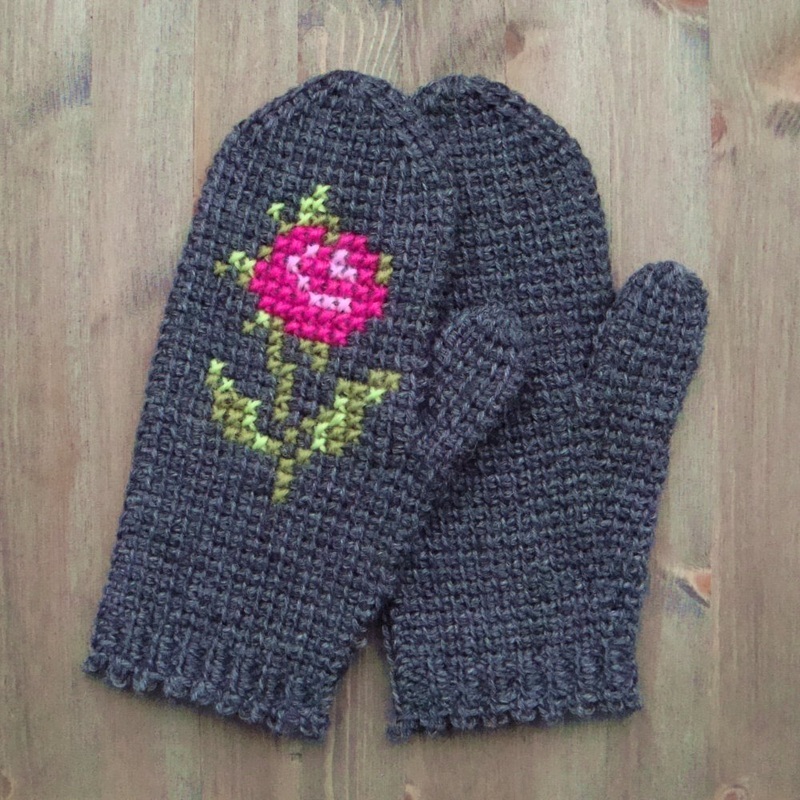 It was a challenging project, but also an enjoyable one! 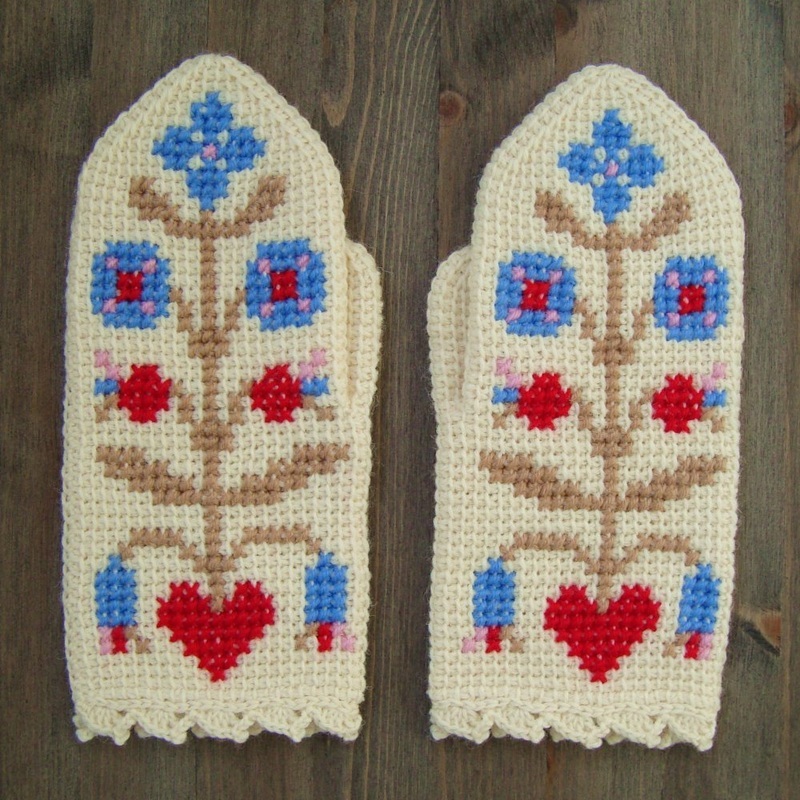 Inspiration for these mittens came from traditional Scandinavian and Baltic patterns. 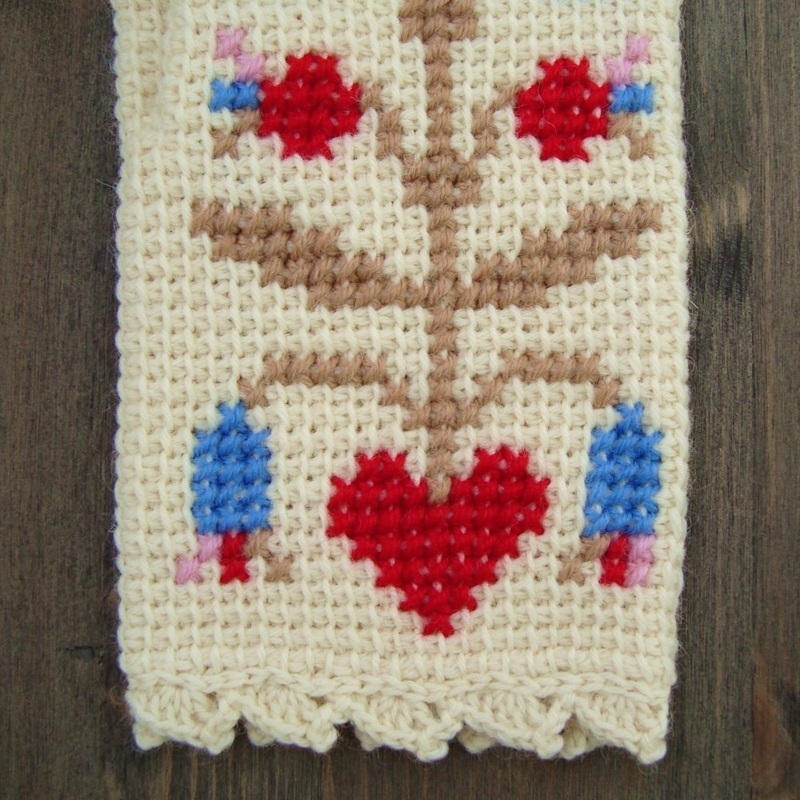 The colors are mostly Scandinavian, the structure of the motif is Baltic. 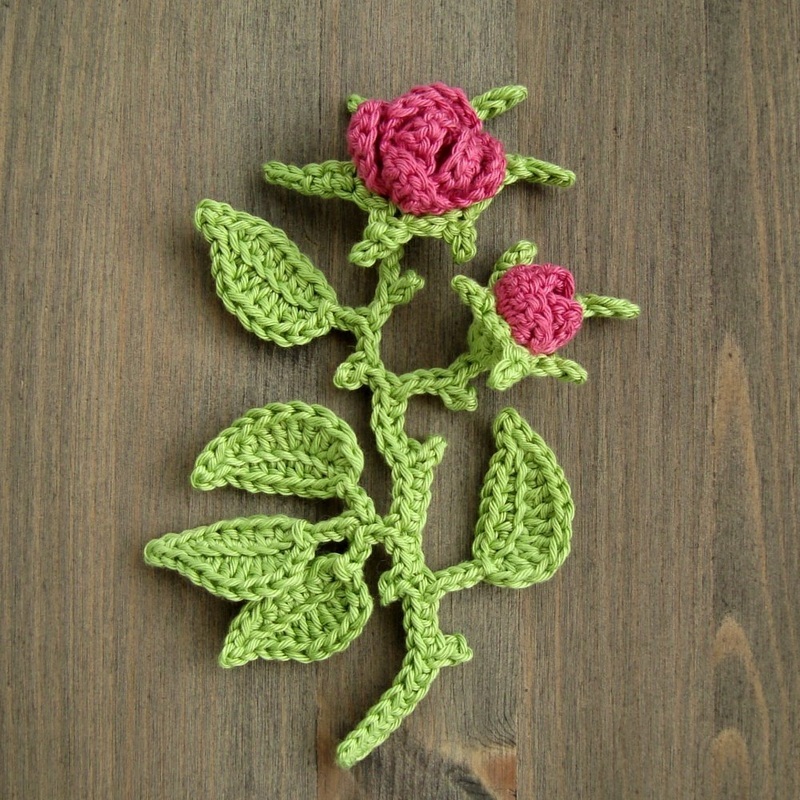 – The floral motifs of this kind used to be painted on furniture in Baltic countries in the 19th century. 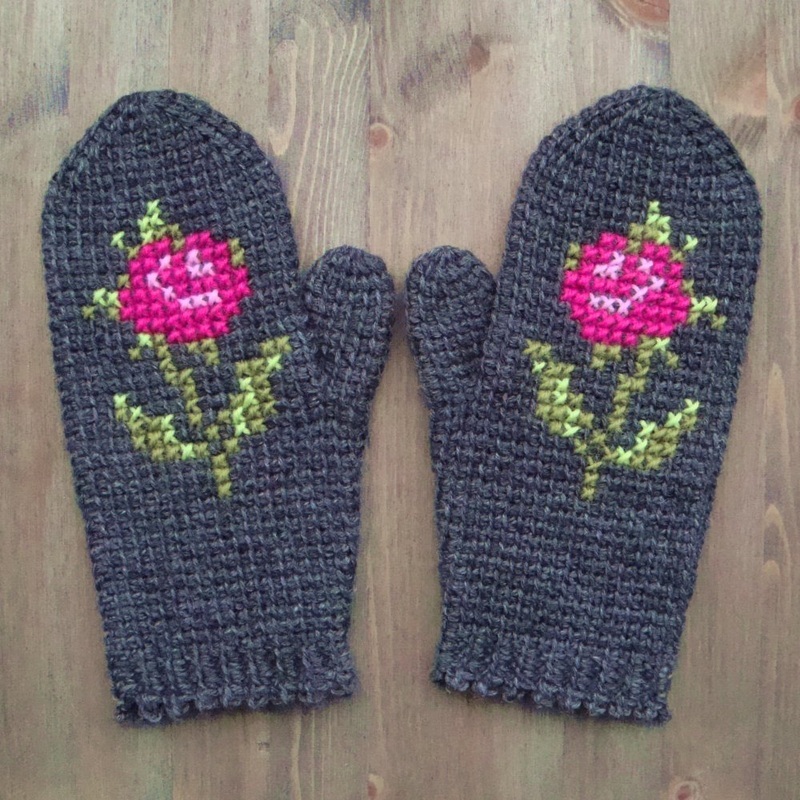 The base for these mittens is the same as for mittens #25 'Mittens In Tunisian Crochet With Cross Stitch Roses'. 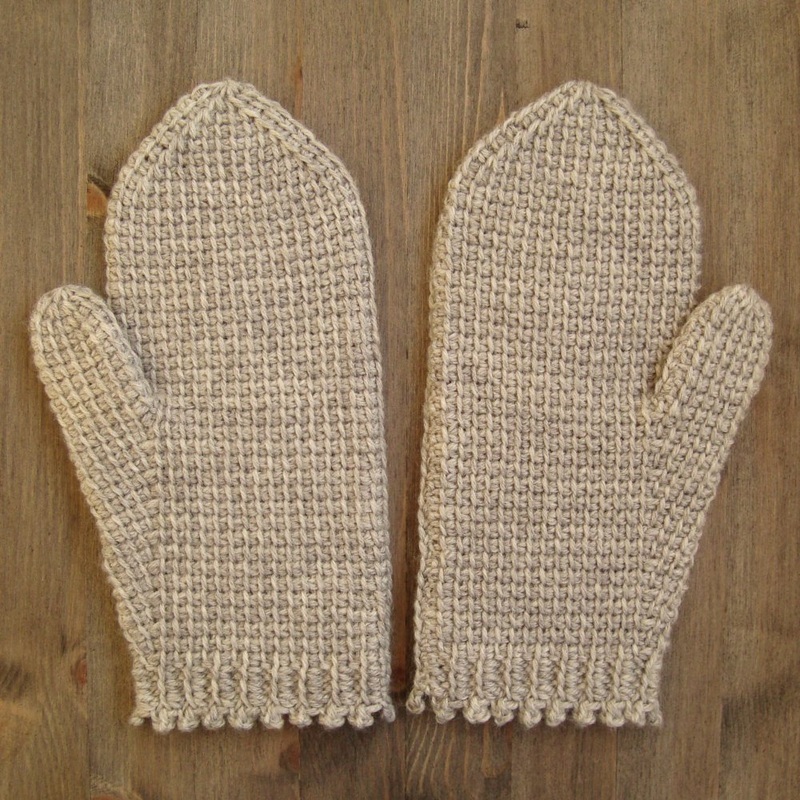 These Waste Yarn Mittens are crocheted in Tunisian crochet in rounds after the same model as mittens #44 'Christmas Mittens 2013'. 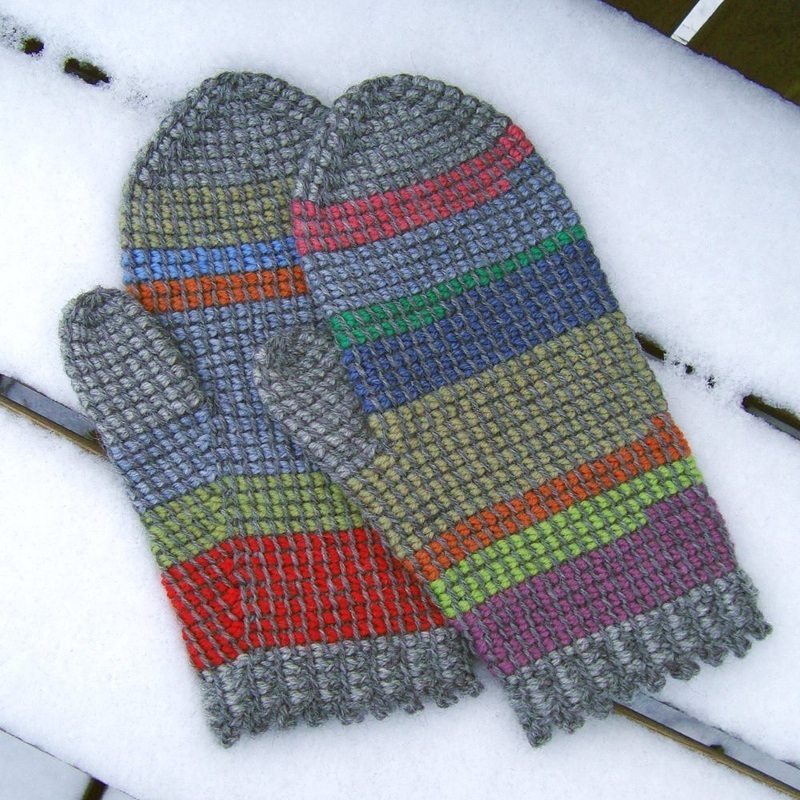 A one-colored yarn (dark gray) was used for picking the stitches up, and waste yarn in different colors was used for working the stitches off. The colors were chosen more or less randomly, and they were also changed at random places. 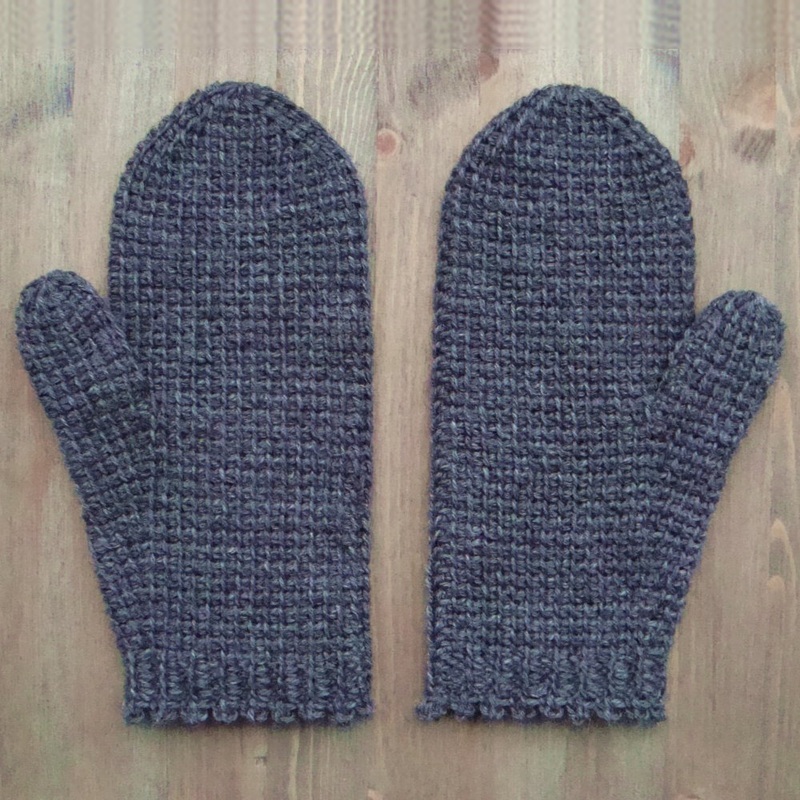 Only the ribbing, the thumb and the top of the mittens were worked off using the same color (light gray), and the yarn in these cases was changed at the beginning or at the end of a round. 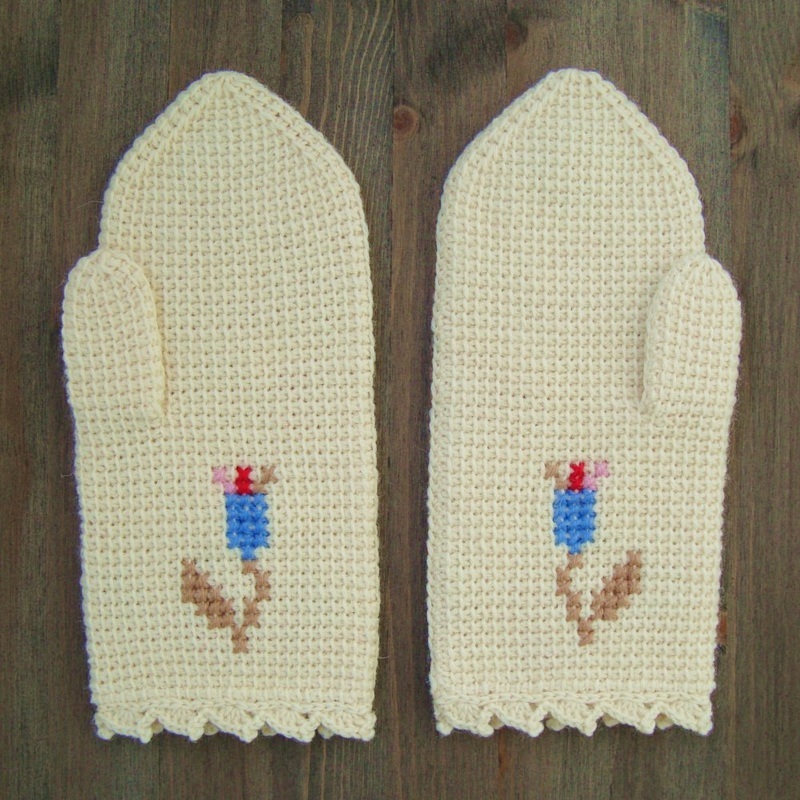 One more variant of mittens in Tunisian crochet with cross stitch embroidery. 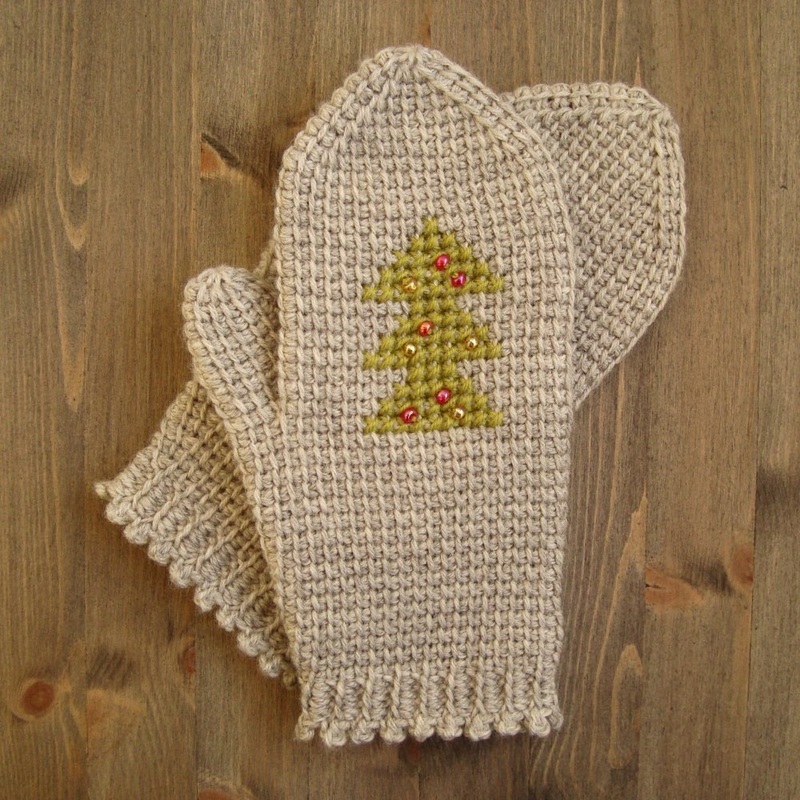 The model is very similar to mittens #44 'Christmas Mittens 2013', only these have 2 stitches less, the top of the mittens is more round, and the loops for the left thumb were picked up in a different way. 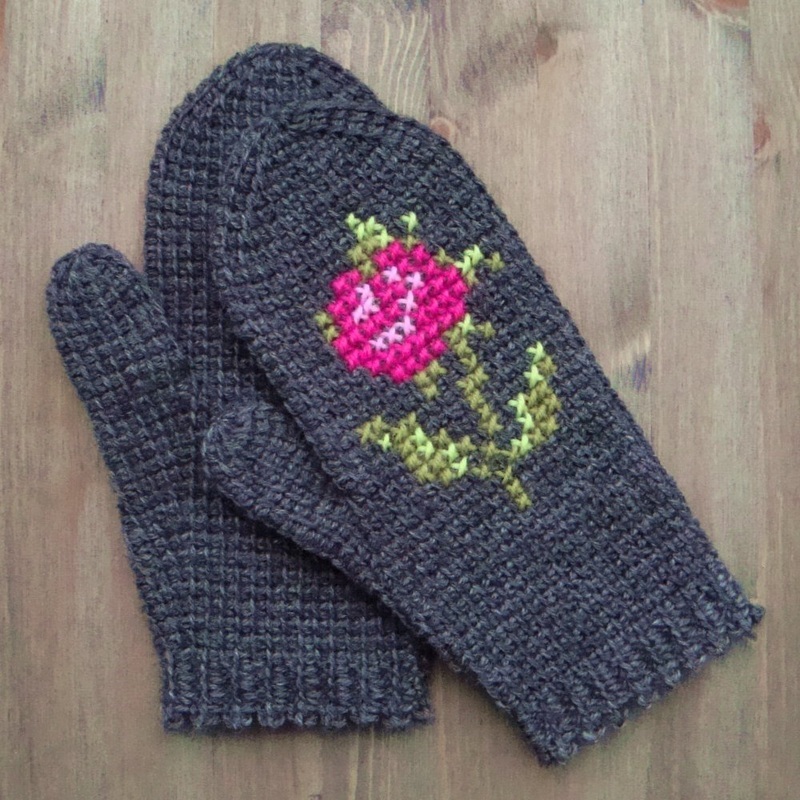 The motif is the same as for mittens #25 'Mittens In Tunisian Crochet With Cross Stitch Roses', only more simplified. 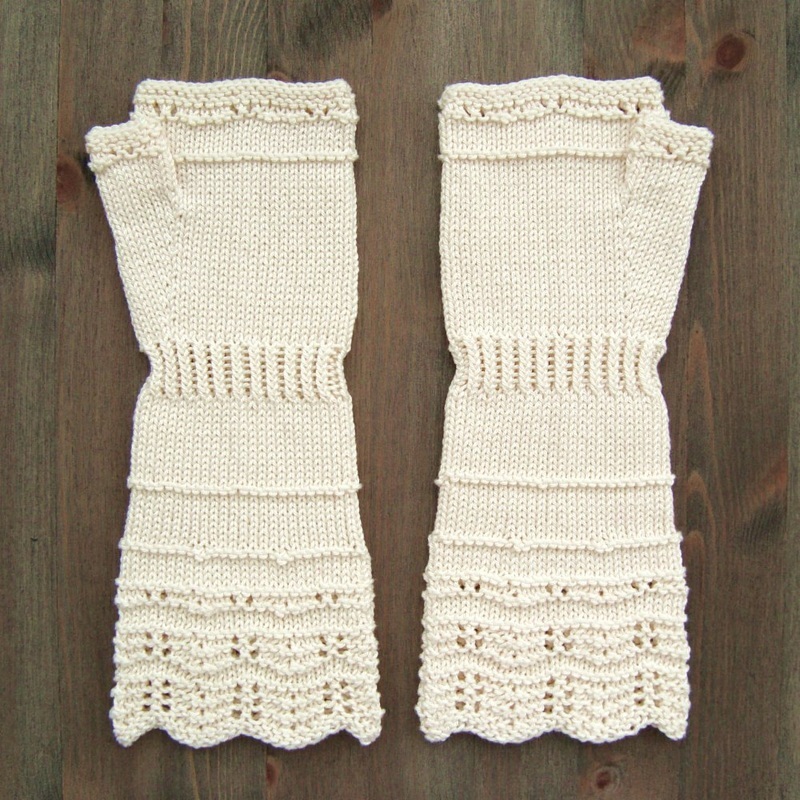 I like this simplified version even more – these mittens are more ordinary and you can use them in your everyday life without attracting too much attention! 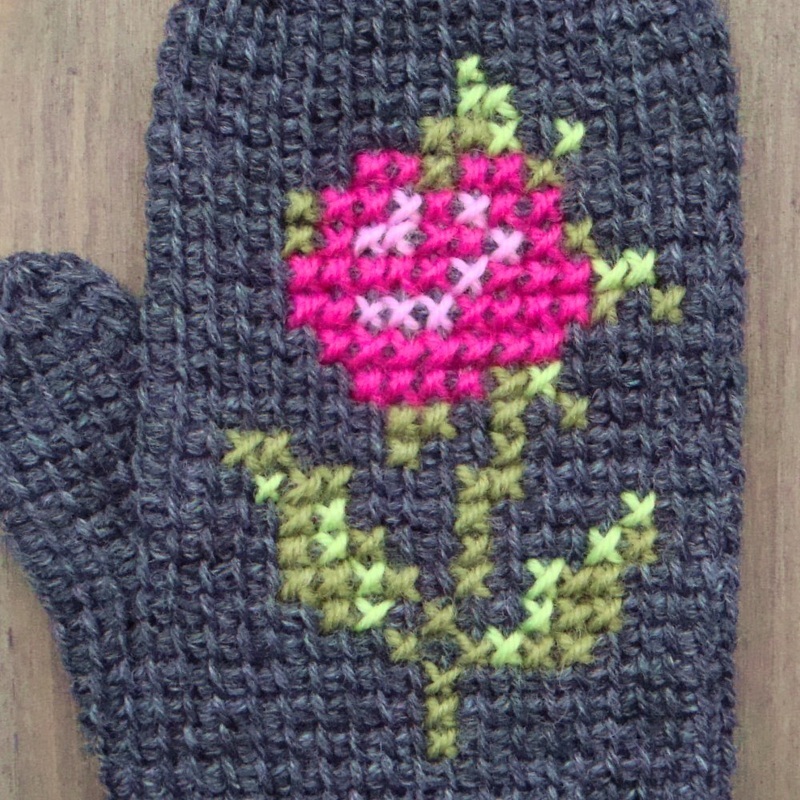 It's been already a while since I started making mittens and I've tested quite a lot of different techniques. 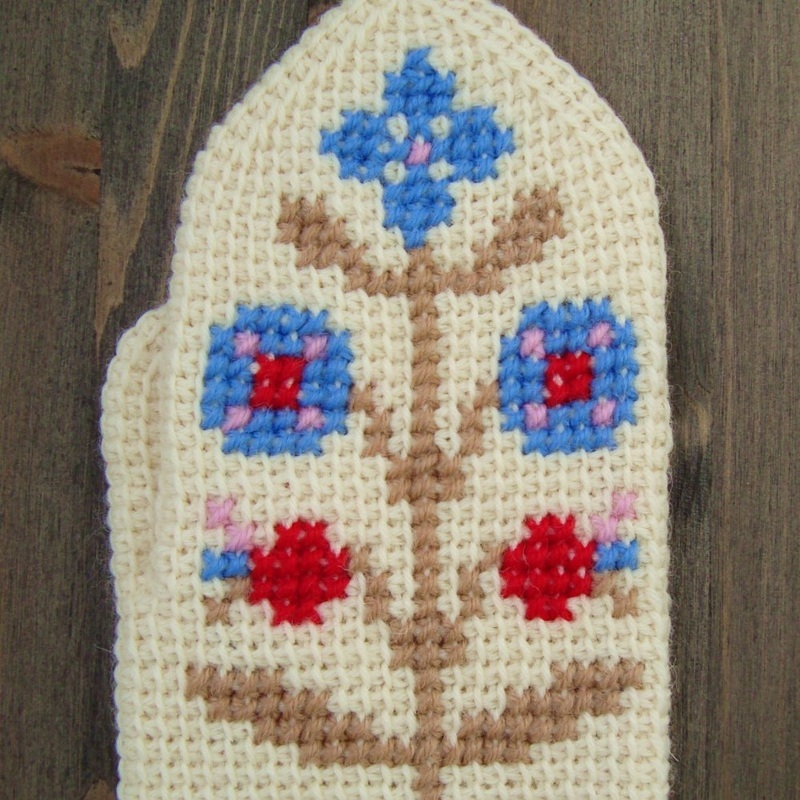 And my favourite technique at the moment is Tunisian crochet. 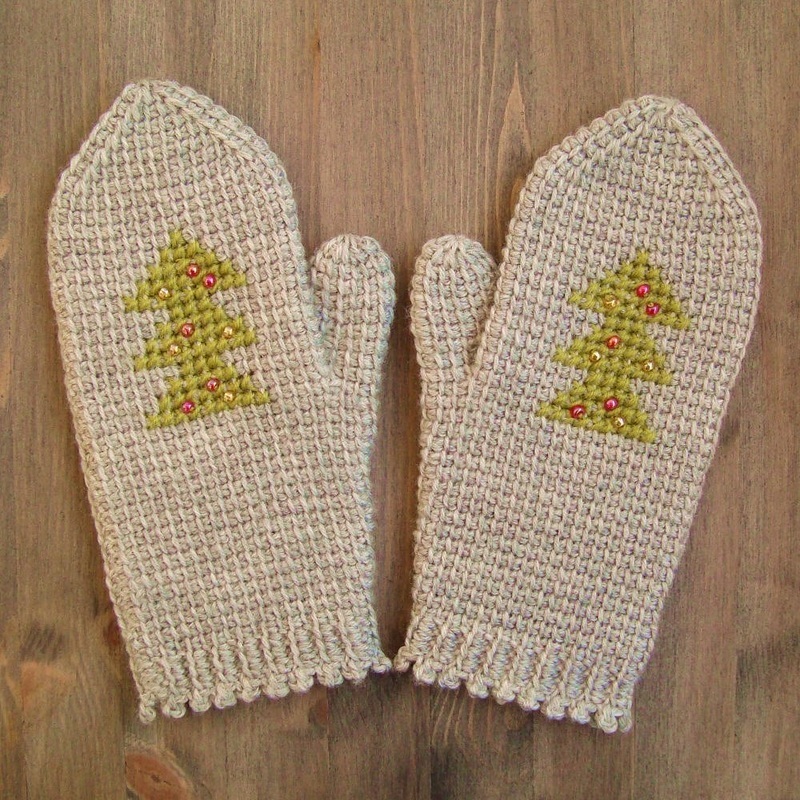 So Christmas Mittens of this year were made in Tunisian crochet. 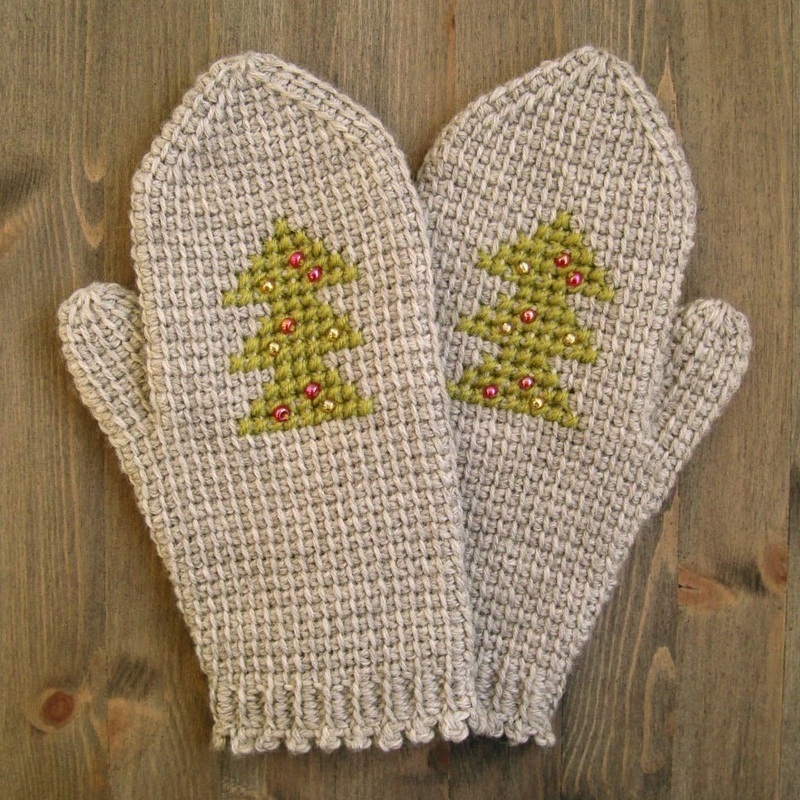 I used Tunisian simple stitch as a main stitch and embellished the mittens with Christmas-tree in cross stitch embroidery. 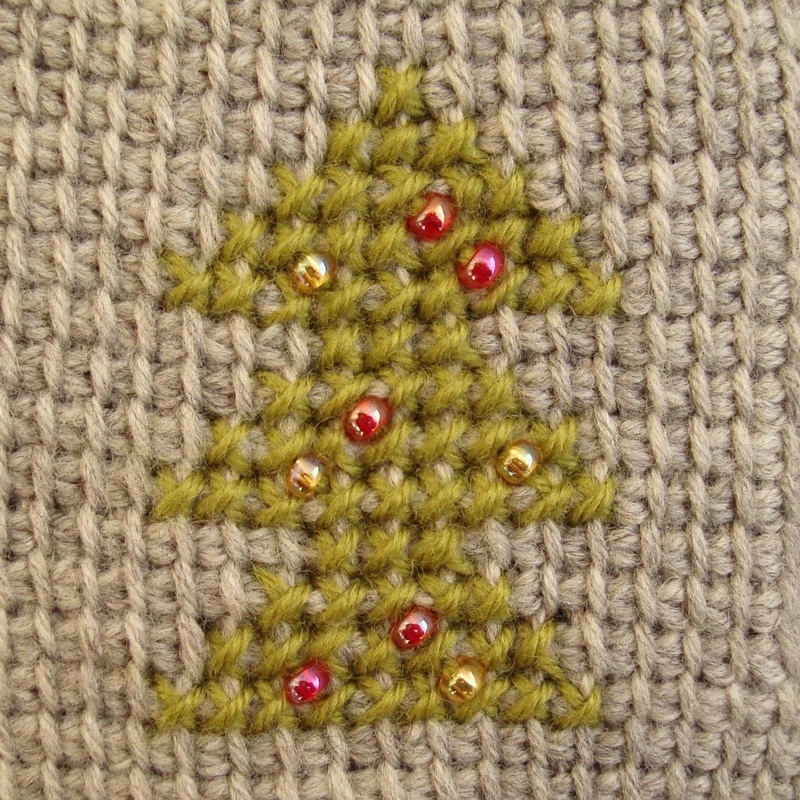 For Christmas-tree decorations I used shiny glass beads in red and yellow. 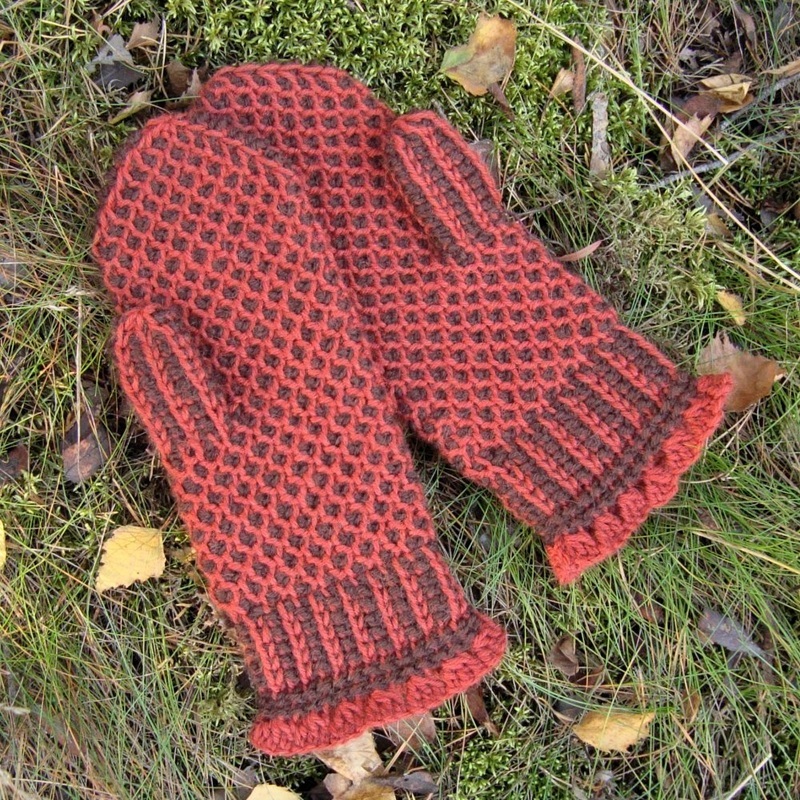 The yarn is also a bit shiny, it's a 100 % superwash wool of high quality. 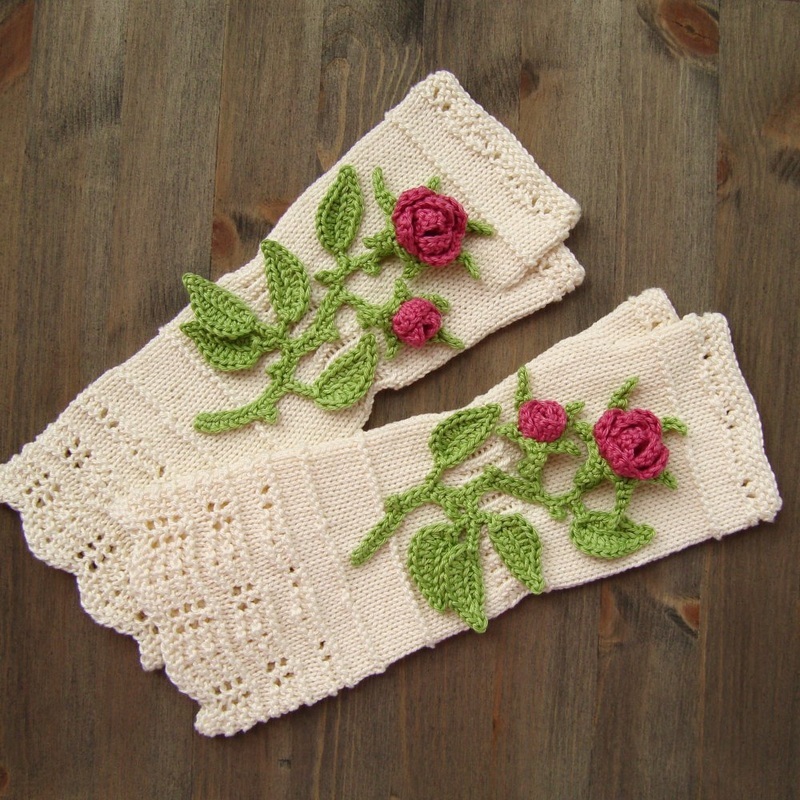 So even though the colors and the pattern are modest there is still a feeling of magic and festivity here! 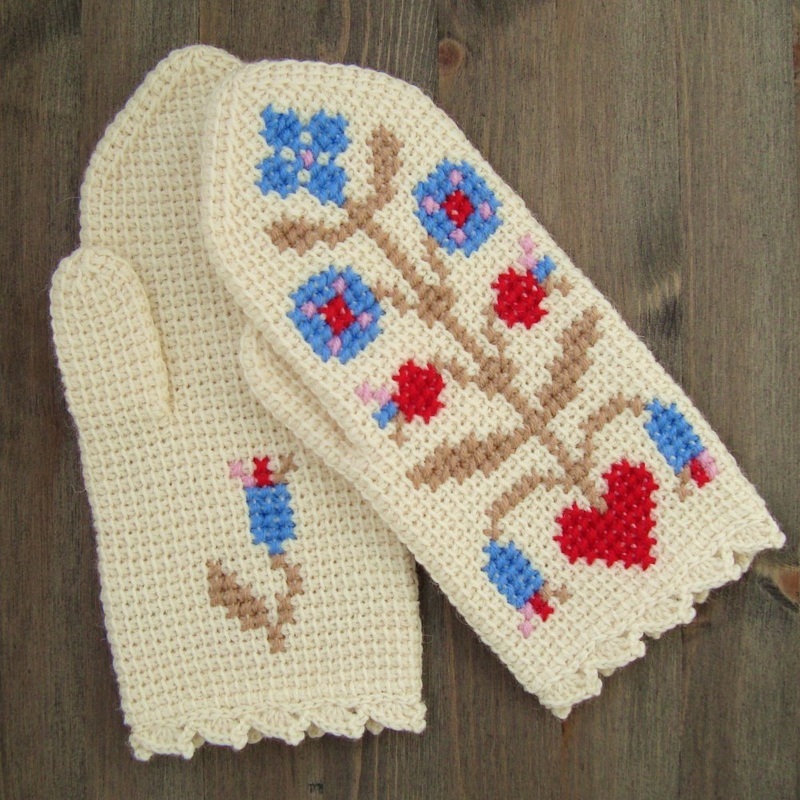 The mittens are made in Tunisian crochet in rounds. 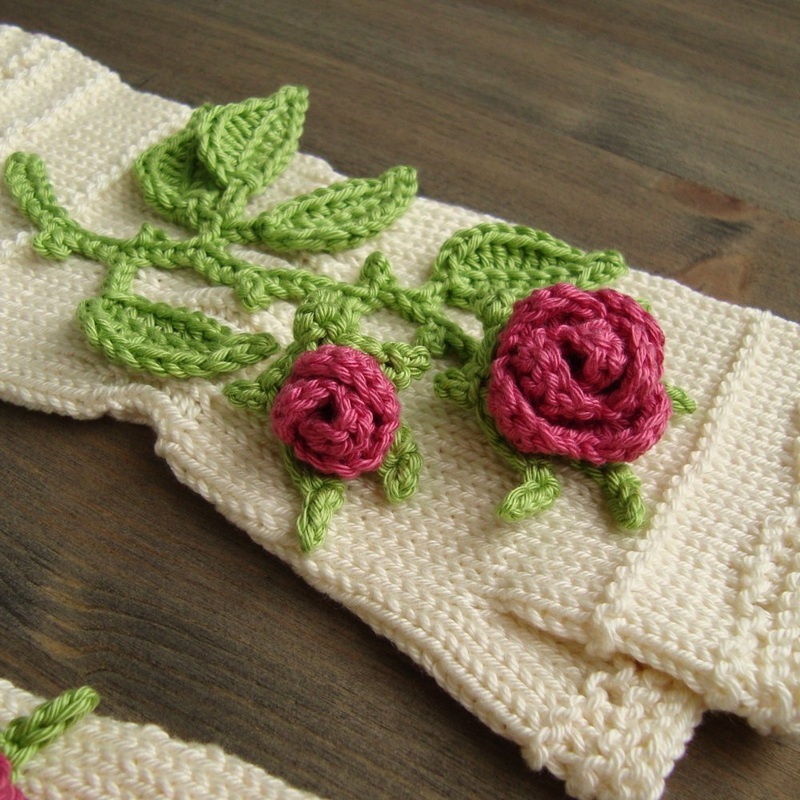 The exciting thing about this technique is that it allows to use different colors for picking the stitches up and for working them off, and working in two colors makes a stitch pattern stand out better. 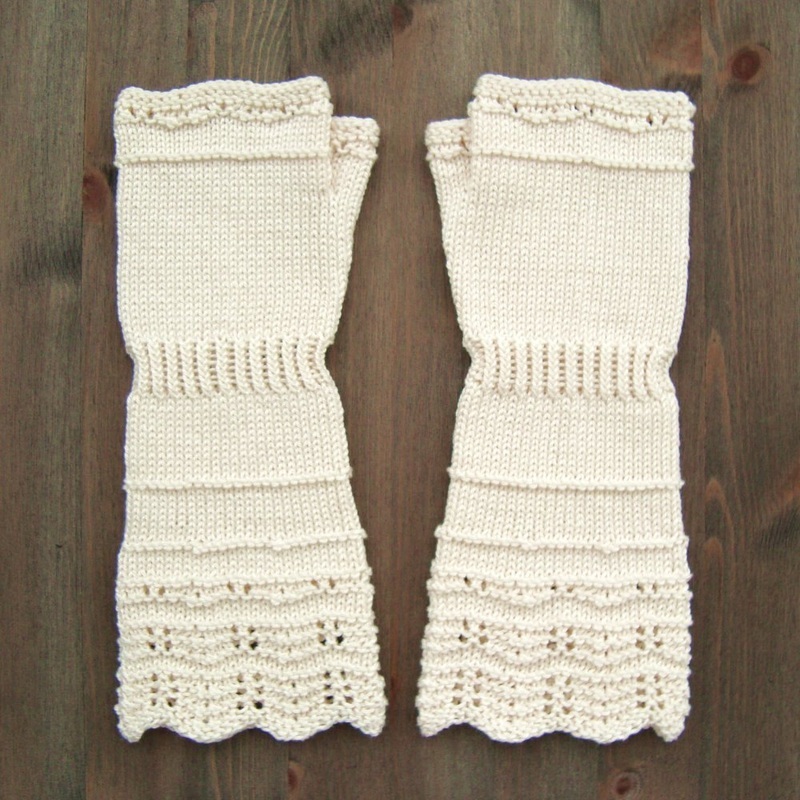 Several stitches were used for these mittens – the main stitch is the honeycomb stitch. 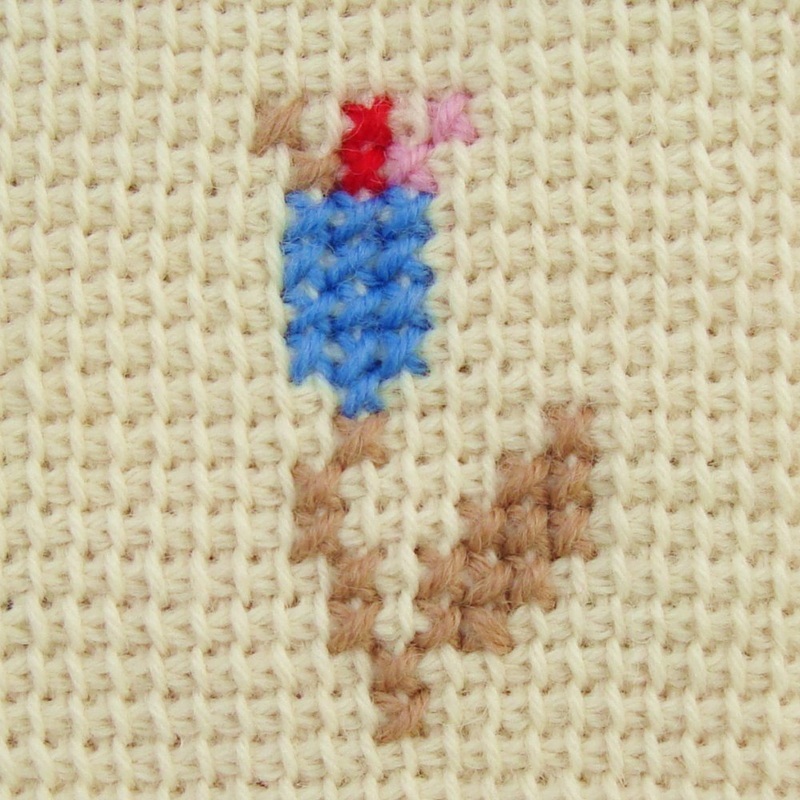 The stitches were picked up with a lighter color.